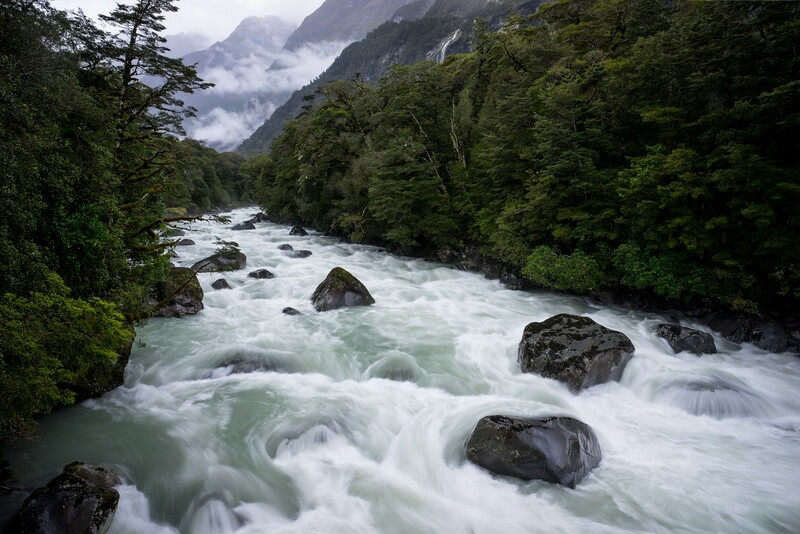 After the Catlins Coast my next destination was Fiordland, located in the south-west of the South Island. This region comprises New Zealand’s largest national park with lush, untouched rain forests, steep mountain ranges and, of course, the fiords themselves cut out of the mountains by glaciers a time long ago. My visit to Fiordland first covered the Milford Road leading to the main tourist attraction on the south island: Milford Sound. 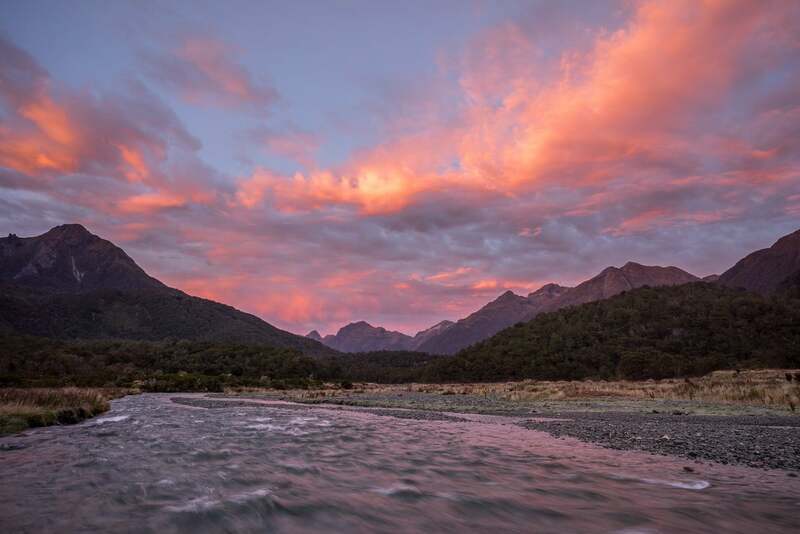 Thereafter I hiked the Kepler, Routeburn and Caples Tracks, the latter two starting from Glenorchy not far from Queenstown. Later – after a detour to the Wanaka area – I hiked the Dusky Track, that I will cover in a dedicated post. My first stop in Fiordland was at Lake Manapouri. 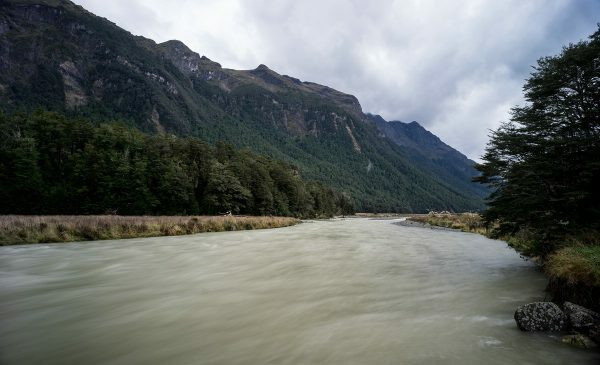 The lake has been regulated for a hydro power scheme but fortunately the water level is relatively stable – keeping the vegetation at its shore intact. 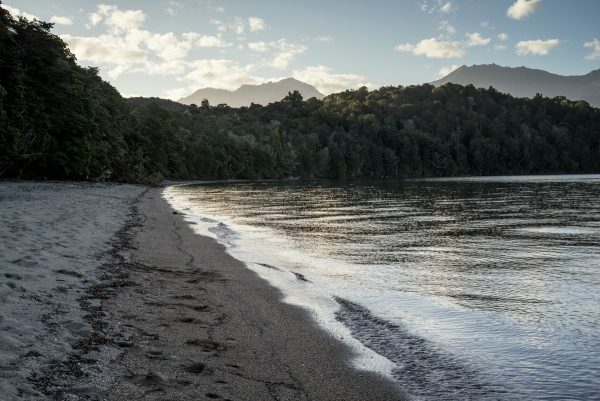 The beach near the Manapouri village offers nice views to the Fiordland mountains – assuming the weather’s cooperation. 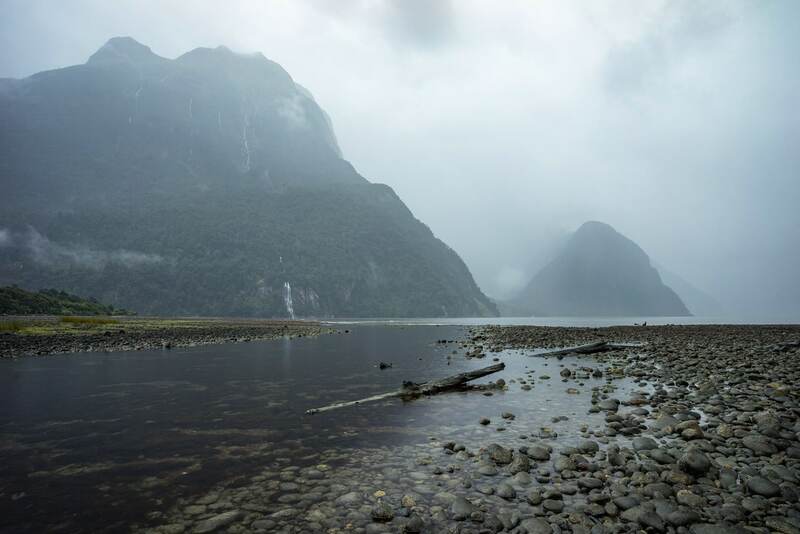 Fiordland is one of the rainiest regions in the world, thus it is likely that the scene will be similar to the one above. 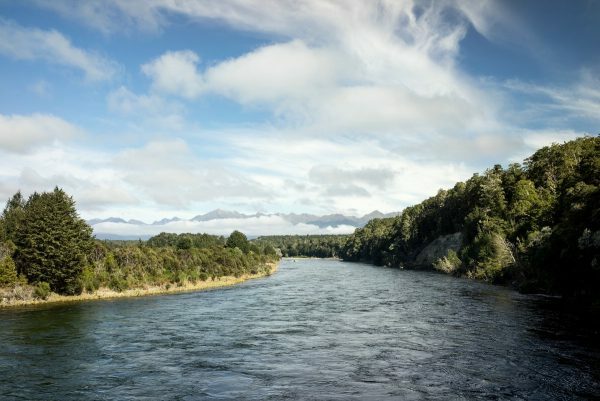 Not far from Manapouri the town of Te Anau is located. 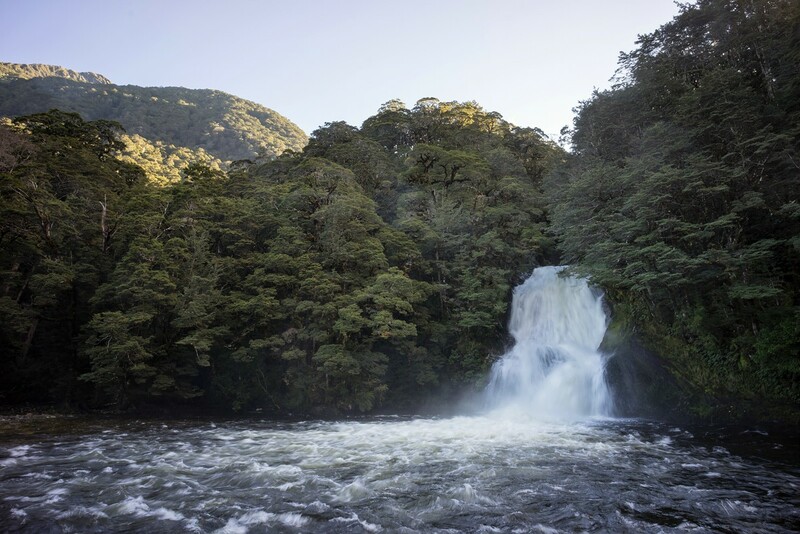 It is a basis for a lot of tourist activities and can be seen as the gateway to Fiordland. 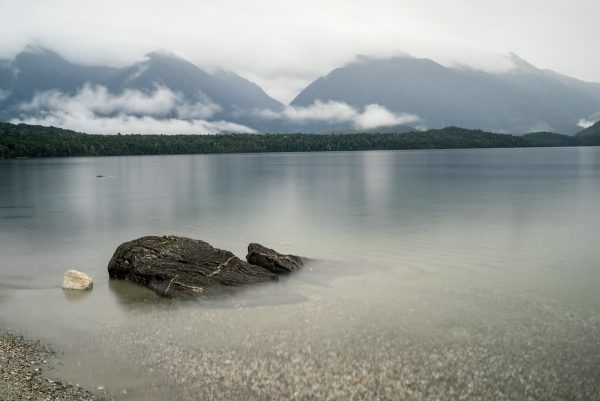 Te Anau is directly on the shore of the identically named lake – the largest lake on the South Island. 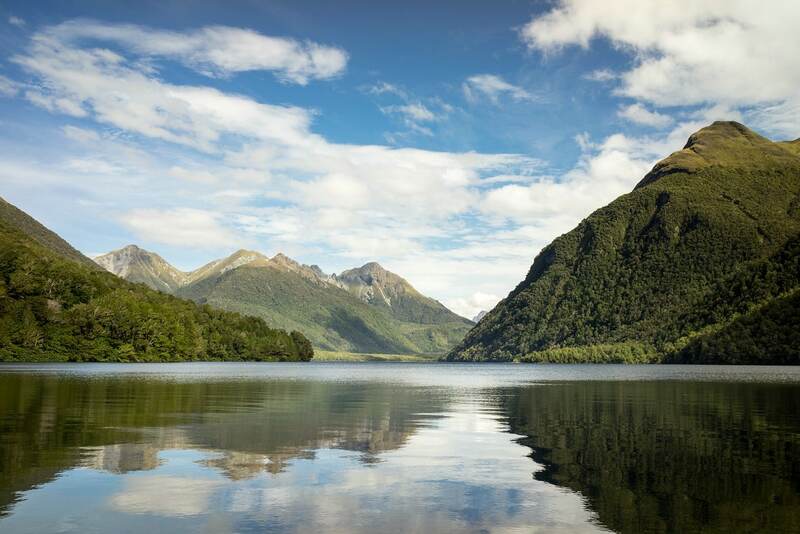 Te Anau is the starting point of the famous Milford Road leading north into the Eglinton Valley. Due to its touristic importance there is a lot of traffic and you will rarely be alone when stopping to admire the scenery. There are several DOC campgrounds near the Eglinton River that are great for spending a night – I would do so on my way back. Heading north, I stopped several times in Eglinton Valley, walked to the river and did a forest walk near Lake Gunn before moving on towards the Hollyford Valley. Another interesting stop may be the Mirror Lakes. However, expect bus-loads of people there. The closer I came to the pass and Homer Tunnel, the wetter the weather became. On the other side of the tunnel it was no better and the visibility was not good at all. Nonetheless the scenery is really impressive near the pass. In rainy weather lots of small waterfalls cascade down the steep and bare rock. There are lots of interesting day hiking opportunities which I left out for weather reasons. Now, I regret not having stopped more often. As a landscape photographer it’s sometimes necessary to endure inclement weather to obtain good images. From the pass the road descends in many switchbacks towards Milford Sound. It is worth stopping here and there. Especially the side streams coming down from the mountains offer interesting photographic opportunities. Also The Chasm is worth a stop but crowded. 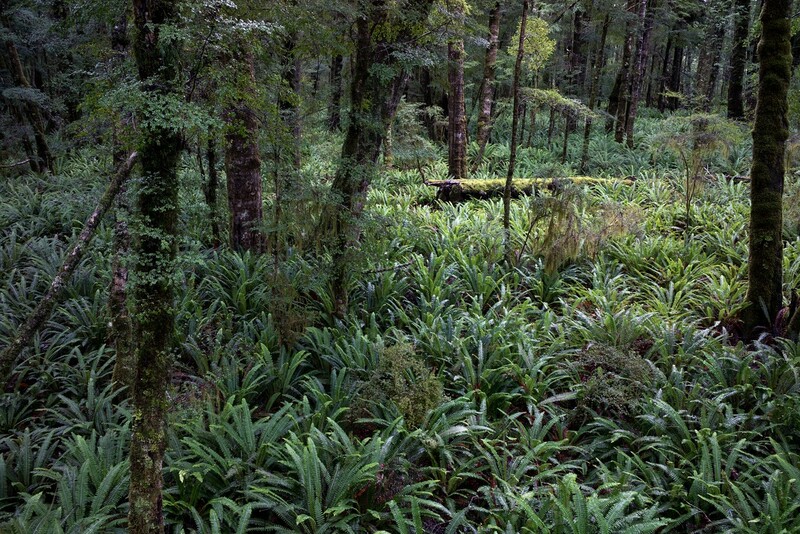 In particular, I enjoyed the contrast between the lush rainforest and the alpine scenery. When I reached my destination, Milford Sound, I was really disappointed. Not because of the rain. But because the landscape is severely impacted by an airport and a huge cruise ship terminal along with the necessary infrastructure. 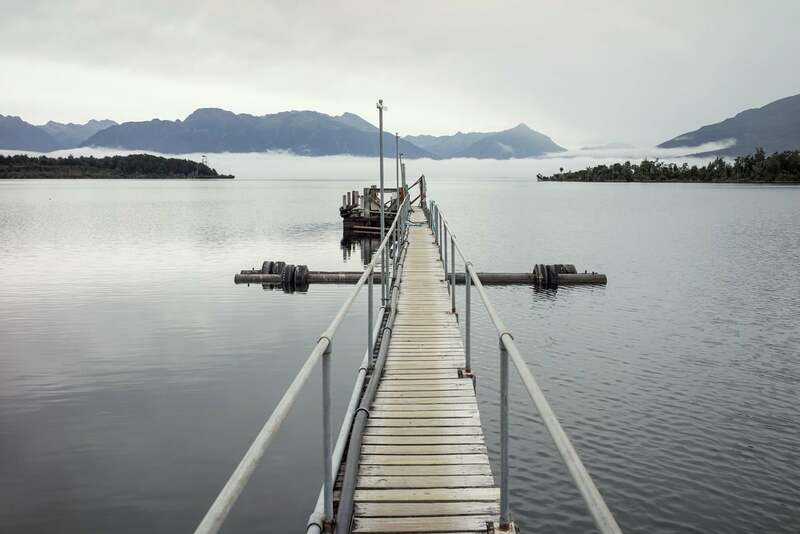 At this location there isn’t much of nature left – except the stunning view into the fiord itself. It is somehow ironic – tourists are there to admire the beauty of the landscape – but it is destroyed or at least heavily tainted because of them. Of course, I myself also contributed to this with my trip. 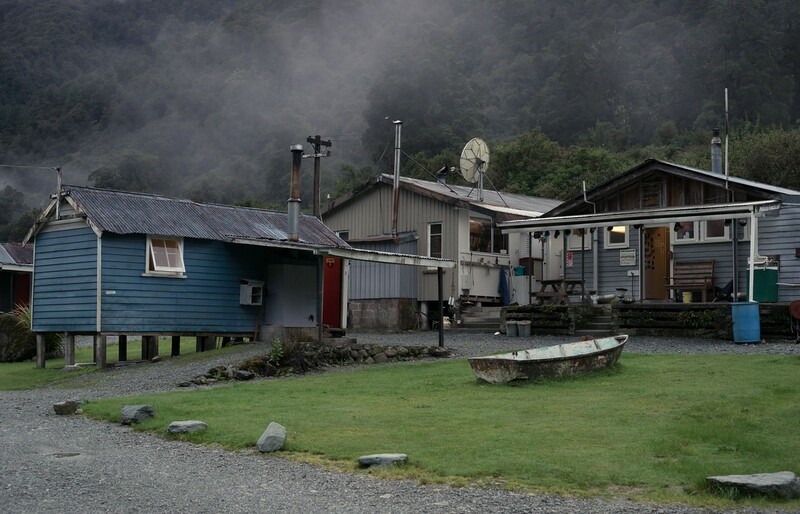 Most photos from Milford Sound don’t show all the infrastructure and buildings at the south-east end of the fiord and look more or less like the following (but most likely with clearer weather). The cruise ship terminal would come into view at the right-hand side. 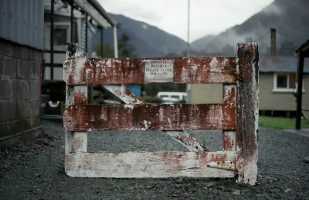 My map showed the existence of a campground at Milford Sound, but this seemed to be outdated information. The only accommodations are Milford Lodge or expensive hotels. 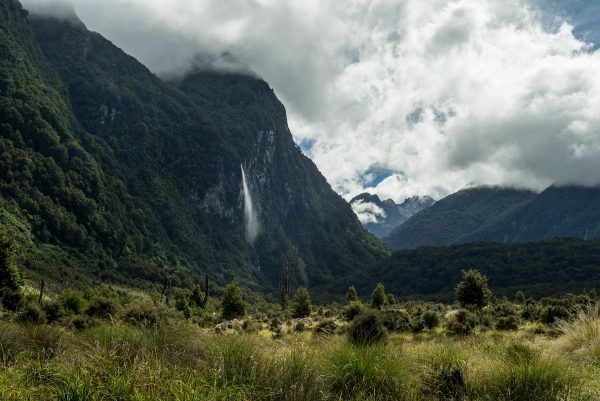 I thus decided to head back to Hollyford Valley and leave out any further activities at Milford Sound. From the Milford Road a gravel road branches off leading into the lower Hollyford Valley. 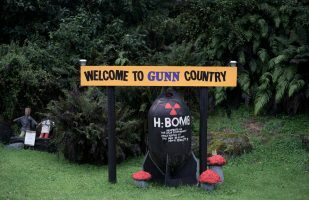 Few kilometers before the road end Gunn’s Camp is located. It’s a campground that is off the average tourist’s path. The camp’s owner has paid a lot of attention the the details – they are hilarious. It was really refreshing to stay in this location so different than any other campground. The weather didn’t improve much the next day – at least it was not raining constantly. 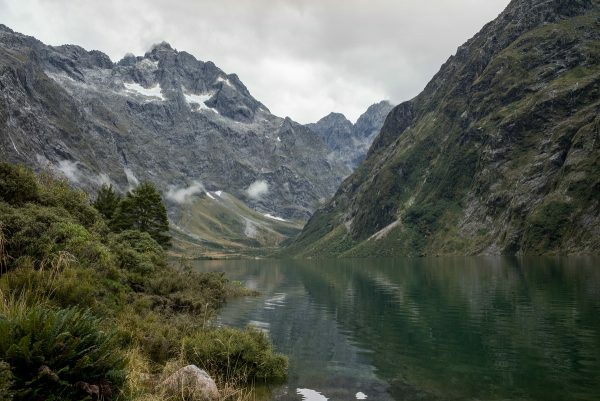 I opted for a hike to Lake Marian from the Hollyford Valley. 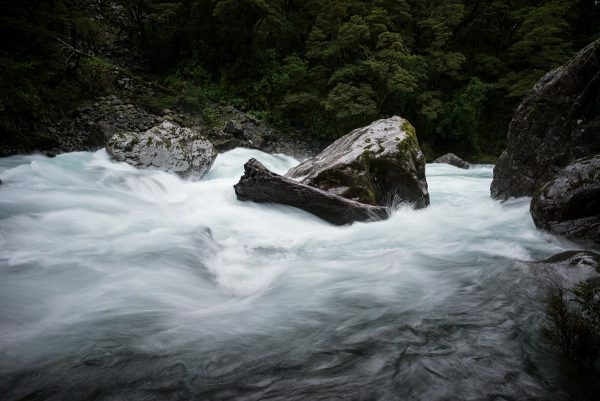 Not long after crossing the Hollyford River on a footbridge you reach some interesting cascades of the stream coming from Lake Marian. In my opinion it is difficult to get good photos of them, however. The hike up to the lake is not done by a lot of hikers; a little bit of scrambling across wet roots is necessary. Reaching the lake, I first was not able to get a good view as the path leading to the shore was totally flooded. I took another route through the brush to get closer to the lake. The scenery is very impressive. Unfortunately, the weather conditions were not really favorable. But I think the gloomy atmosphere has its appeal too. 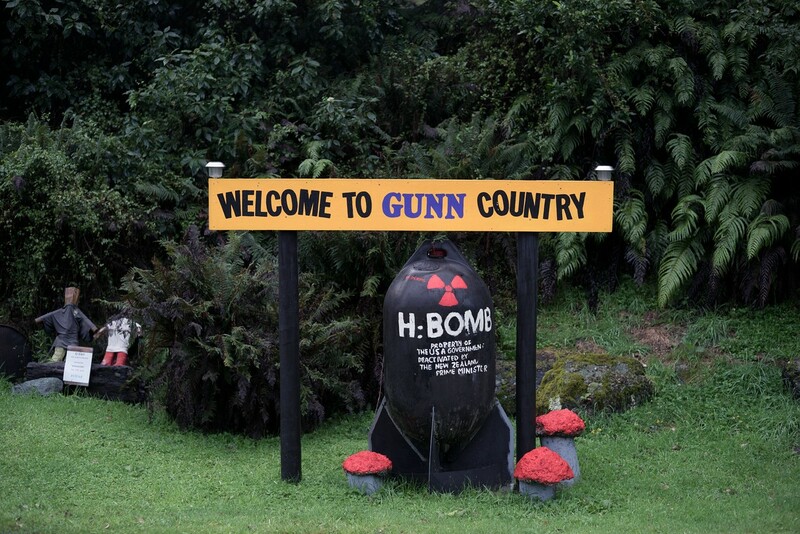 When I returned to my car I drove back into Eglinton Valley where I stopped again at Lake Gunn. Finally there was some sun that made the return trip really enjoyable. I spent the night at one of the DOC campgrounds in Eglinton Valley. I drove back to Lake Gunn in the hope for some sunset light which unfortunately did not work out. In the morning, however, it was well worth getting up early as the light turned out quite spectacular. I shot the following image directly near the campground. I returned to Te Anau to buy food and prepare my gear for a 3-day hike on the Kepler Track. As a Great Walk, this track requires pre-booked accommodation throughout most of the year. In my opinion, the huts are overpriced for what you get – at least in comparison to the huts on “normal” tracks. They are also very crowded. Thus, I opted for camping which is a lot cheaper, and normally the campsites are not sold out as quickly as the huts. 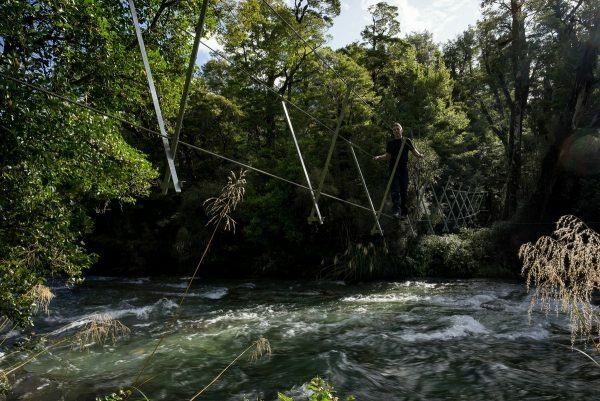 Like all great walks, this track is easy to walk – the markings would not even be necessary as you can never miss the trail and all streams are bridged. I hiked this loop track in clockwise direction starting at Rainbow Reach; most hikers do it the other way round. 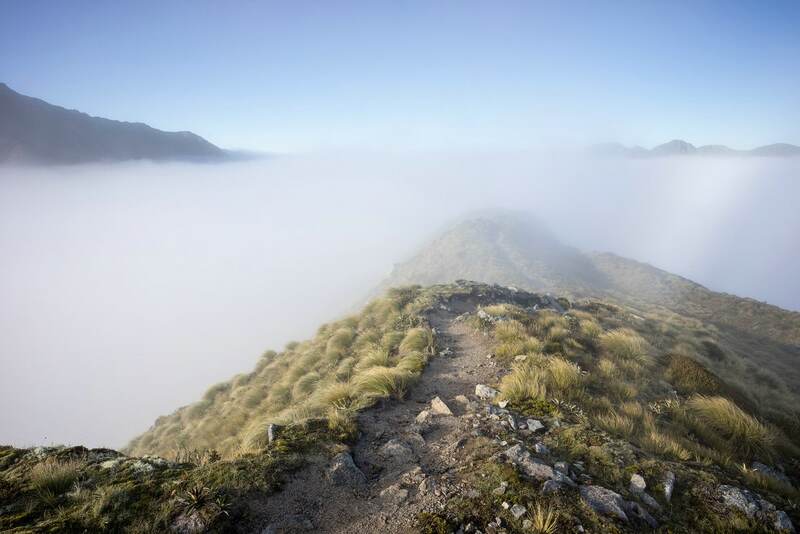 In any case, on the second day the alpine section, the most spectacular part of this track, is traversed. The first section (in my walking direction) is mostly consisting of dense forest with large moss-covered trees and ferns on the ground. Although you can rarely see into the distance, it is really enjoyable. 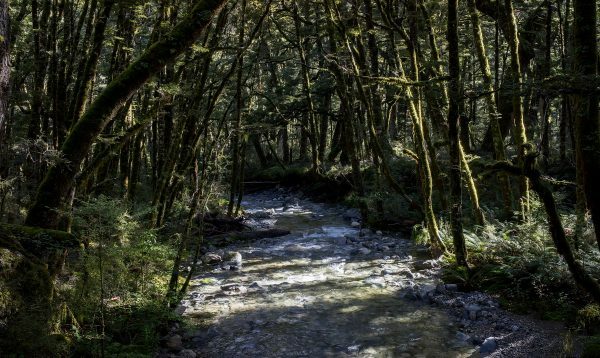 After passing the shore of Lake Manapouri the track follows the Iris Burn and from time to time you have a view of the stream. After many kilometers of forest walking there is a brief open section caused by a land-slide that offers a view of a small waterfall in the distance (see the image at the head of this article). 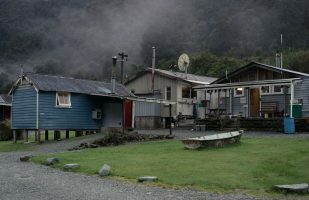 In the afternoon I reached Iris Burn Hut and the corresponding campsite. When I set up my tent there were only two other campers there. This changed later, and the campsite got quite full. I took my camera for a small walk to the Iris Burn Waterfall which is located not far away. This is really an interesting location, but expect to get wet due to the waterfall’s spray. The following image shows a wide-angle view of the waterfall to show the soft evening light on the landscape above. 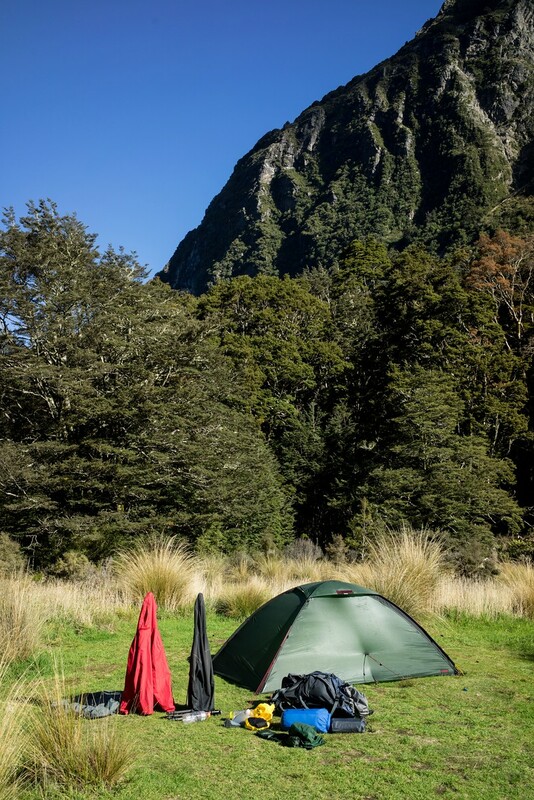 The following night I wouldn’t get a lot of sleep as the camp was “attacked” by Keas, large mountain parrots. They stole and pecked items of the campers and also tore holes in some of the tents. My boots and tent were affected as well. Nonetheless these birds are impressive and entertaining – and not afraid of humans. As I was awake early, I decided to start my hike still in the dark to hopefully get some sunrise impressions high up on the mountain ridge. 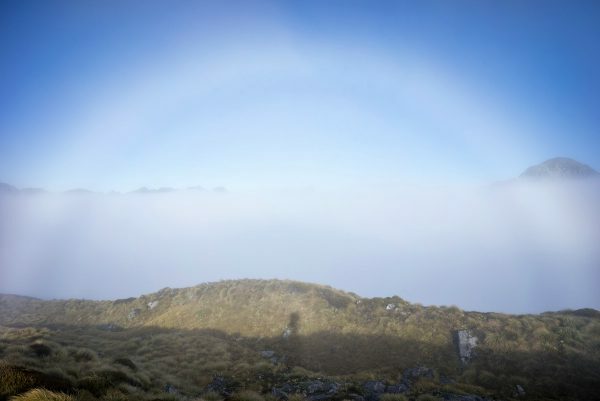 However, after the ascent I was enveloped in fog. It was cold and I decided to wait a bit and prepare some hot breakfast. When I moved on, the fog still hadn’t dissipated. Reaching higher ground, the fog slowly began to become more transparent and let through first glimpses of blue sky. A bit later it was finally possible to get a view of the surrounding mountains and the layout of the ridge system that the trail follows. The remaining fog led to some interesting light. It was really enjoyable to walk along the ridge. For the most part of the second section of the hike, I enjoyed spectacular views. The sky, however, was an empty blue – not ideal for photography. Soon I encountered the first hikers walking in the opposite direction. The route got more and more crowded. 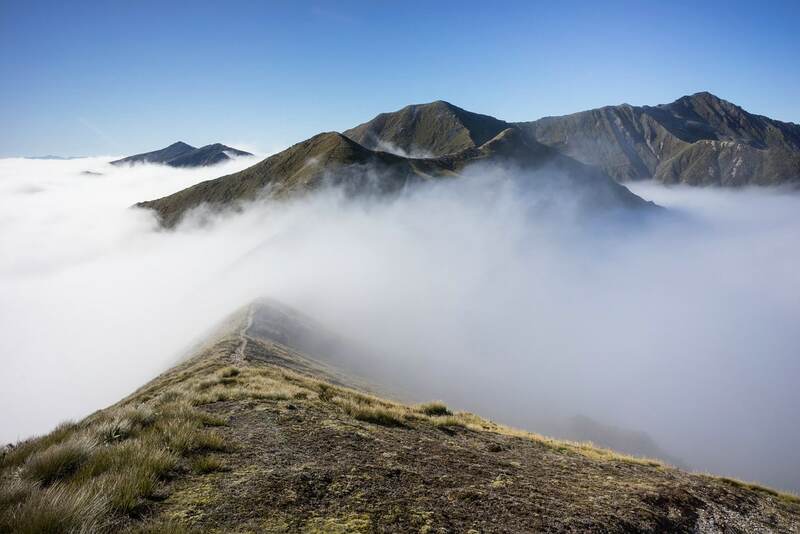 From time to time the path dropped back down into the clouds only to ascend again. I skipped the detour to the summit of Mount Luxmore because it was not possible to see into the valleys due to the low layer of clouds. 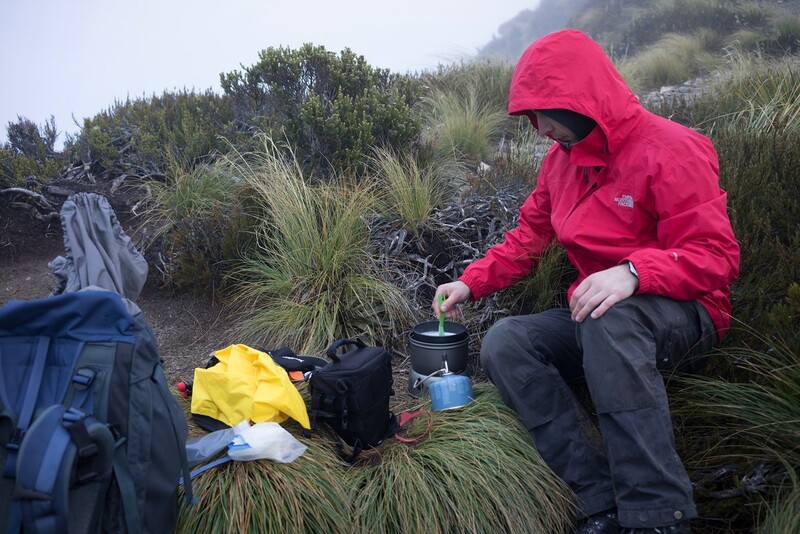 Later, during the afternoon, I reached Luxmore Hut from where the trail descends into the forest. 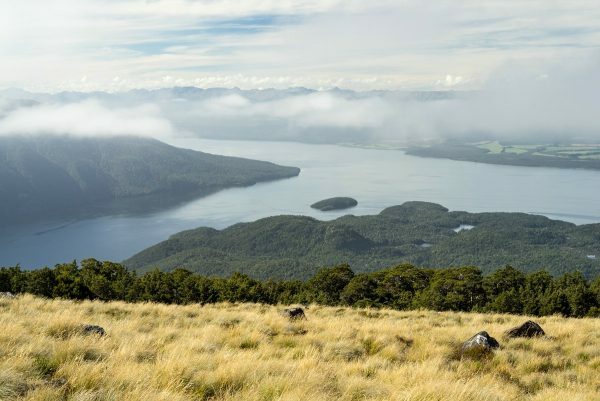 But before reaching the tree line you can get a nice view of Lake Te Anau. At this point in time the low-hanging clouds had cleared to some degree. It follows a long descent to Brood Bay where an official Campsite is located. It was far less crowded than Iris Burn Campsite and features a beach. Nice! I slept much better than the night before and the Keas left me alone. The last day of this hike back to Rainbow Reach was not very spectacular and thus I tried to reach my destination quickly. The first section from Brood Bay had some nice groves of tree ferns. At noon I finally reached the bridge across the Waiau River and my car.